The whole family! That includes babies, children, and pregnant women. Don’t forget the pets too! Beat It repels ticks and fleas on cats and dogs and keeps flies off your horses! 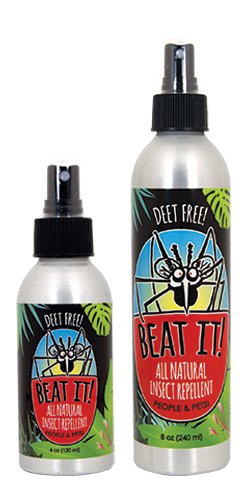 Three Beat It formula variations were tested in the Olfactometer against an attractant, a Deet product and a neutral control for 8 hour test runs. Trials were run in a dark room with fiber optic light to balance choices. Artificial hosts were silicone membrane covered blood agar sources. A wet sensor bite-contact detector was used for determining mosquito or other insect feeding as bite contact seconds. Insect touch and contact was amplified ten thousand times in order to data log information for statistical analysis. Trials were replicated at least 10 times for each 10 choice comparison. Treatments in system were placed on the membrane of the artificial host or in the air streams to determine effectiveness of repellents or attractants. The chart above shows bite seconds for each formulation over the 8 hour test run. The data shown is the average for 10 test runs. In head to head 8 hour mosquito testing, Beat It was compared with the Deet product “Skintastic”. The studies were conducted over a four month test period. The results of this testing indicated that Beat It was as effective as “Skintastic” during the 1st hour after application and after the 1st hour, it was more effective for the next 7 hours.